This dairy free Alfredo sauce is the perfect dinner dish for your family or a crowd. Easy to make and absolutely delicious over pasta or numerous other ways! Completely vegan and gluten free sauce. If your are looking for an absolutely delicious dairy free dinner meal, then this dairy free Alfredo sauce should be on your list. Most people assume that a dairy free Alfredo sauce isn’t even possible, but we are making your dreams come true! 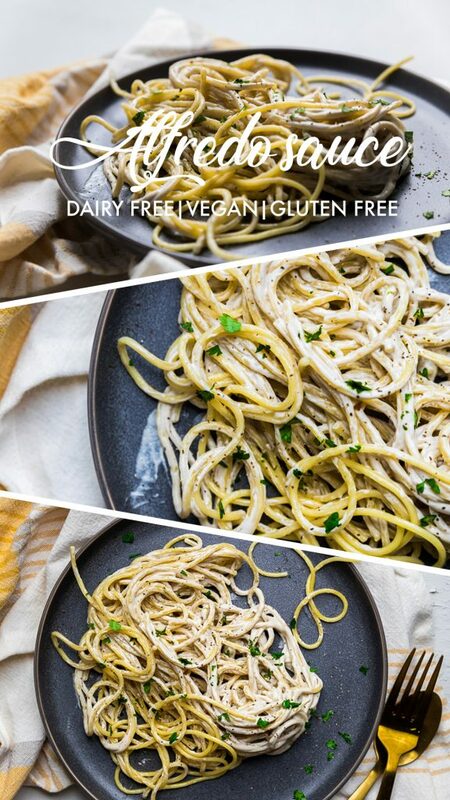 This dairy free Alfredo sauce is perfectly creamy and sticks to your pasta in all the right ways just like any normal Alfredo sauce would do. The taste of this dairy free Alfredo sauce is insanely delicious. 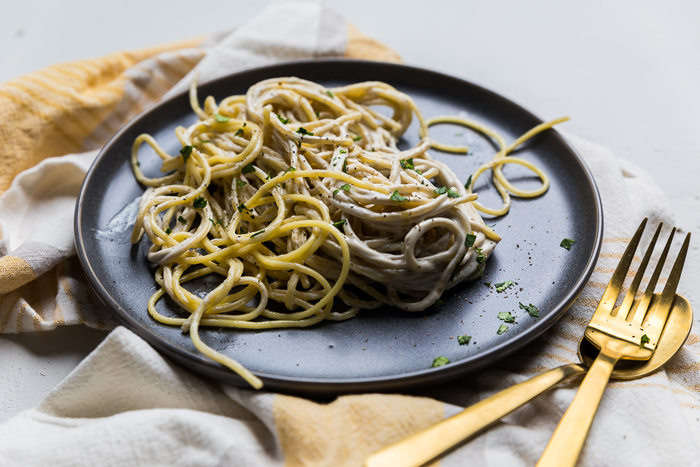 This recipe is also a completely vegan Alfredo sauce, making this a great dish for so many different different dietary needs. 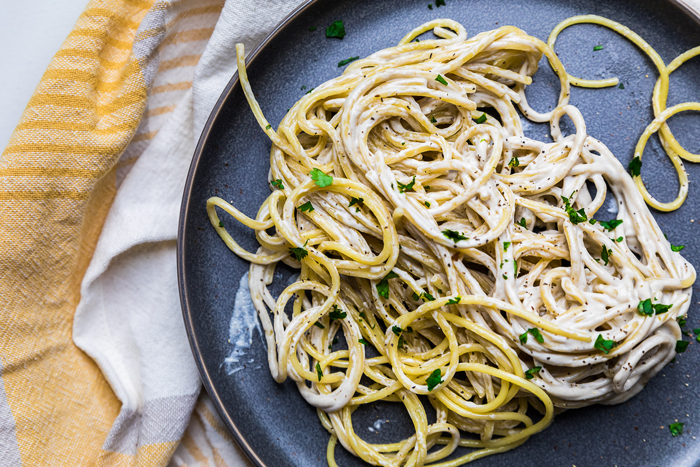 What ingredients do you need to make this dairy free Alfredo sauce? It’s really that simple to make this delicious dairy free Alfredo sauce recipe from scratch at home. 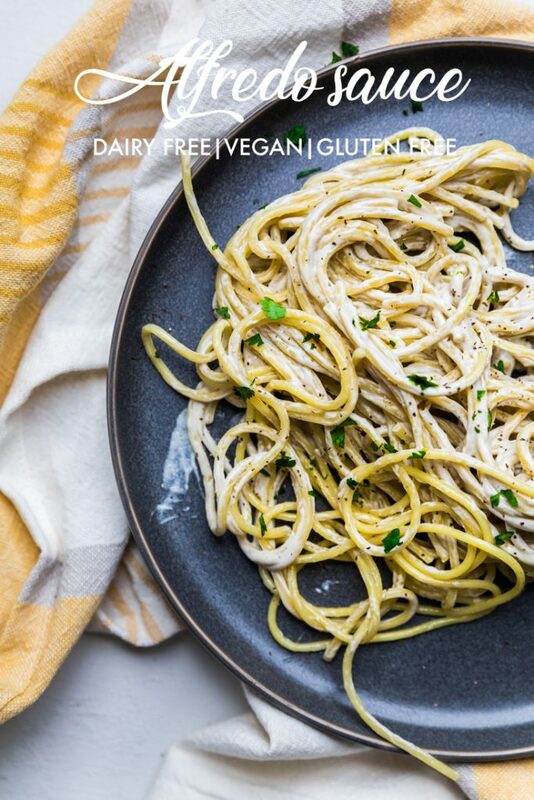 How do you make this dairy free Alfredo sauce? 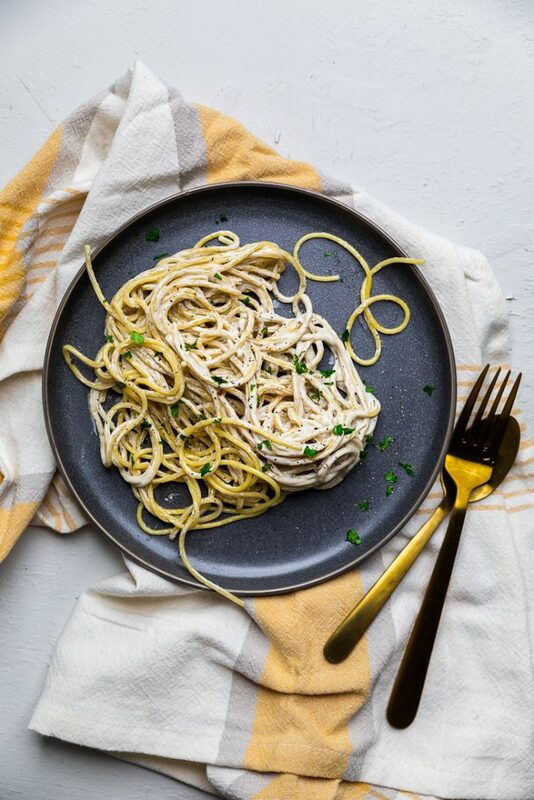 In order to make this vegan Alfredo sauce recipe, the first thing you want to do is to soak your raw cashews. In order to do this, you can place in a jar and cover with water for 6-8 hours or overnight. Another option you have is to boil the cashews for 30 minutes. Lastly, if you have a very high powdered blender, like a Vitamix, you don’t need to soak in water at all for this recipe. Once your cashews are ready, you are going to place all the ingredients (yes, all!) into a high powdered blender or food processors. Blend until you have a smooth and creamy consistency. If the dairy free Alfredo sauce recipe is too thick, drizzle a little more unsweetened almond milk inside until you have reached your desired consistency. Remember, this is supposed to be a thicker sauce as you really want it to coat and stick to those favorite pasta noodles of yours. Once you have your sauce ready, pour it onto hot pasta noodles or place into an air tight container for up to 1 week and place in fridge until ready to use. This dairy free Alfredo sauce will thicken upon being in refrigerator. What ways can I use dairy free Alfredo sauce besides pasta? 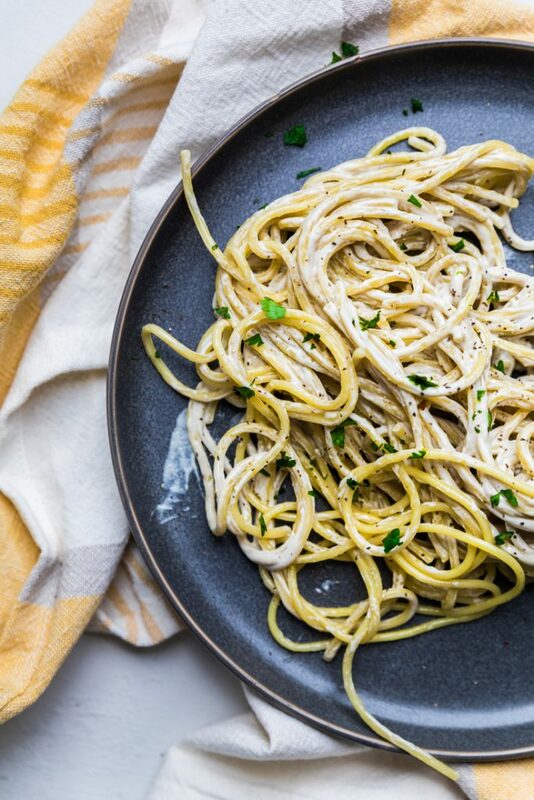 Obviously, you want to use this dairy free Alfredo sauce over your pasta. It’s a given. 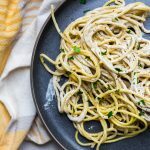 But you may be wondering what other ways you can use this dairy free Alfredo sauce besides just over your favorite pasta. 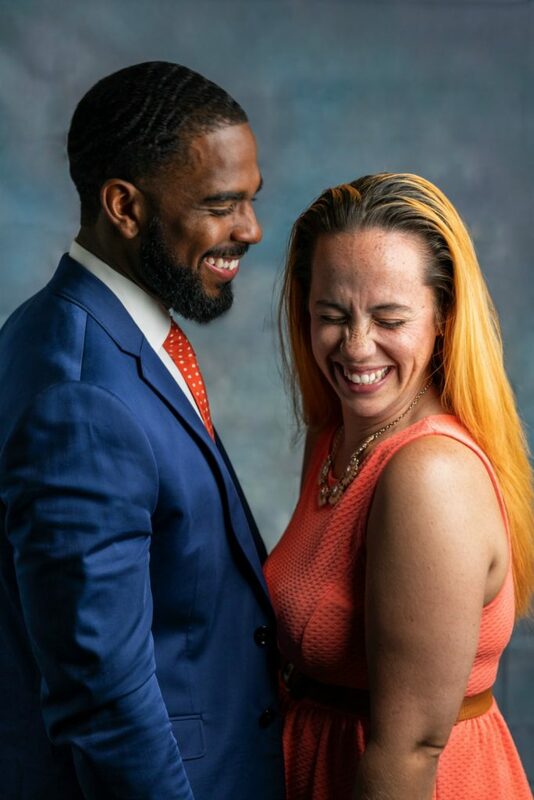 We’ve got the perfect ideas for you. As a gravy – take this dairy free Alfredo sauce and use as a gravy over your next meal of meatballs and mashed potatoes. It gives an amazing consistency and taste to the meal and is a different twist to your normal brown gravy sauce. Marinade – If you are not vegan, you could use this dairy free Alfredo sauce to marinade your favorite cut of meat – like pork loin or chicken breast. In a very high powdered blender, like a Vitamix, you can just add the cashews to the blender and proceeded with the recipe without soaking. Soak your raw cashews by placing them in a jar and cover with water for 6-8 hours or overnight. *If you need this recipe faster, boil the cashews in water for 30 minutes. Remove from heat, drain, and continue with recipe. Once your cashews are ready, place all the ingredients into a high powdered blender or food processor. Blend until smooth and creamy. If dairy free Alfredo sauce recipe is too thick, drizzle a little more unsweetened almond milk inside until desired consistency. Remember, this is supposed to be a thicker sauce as you really want it to coat and stick to those favorite pasta noodles of yours. Pour sauce onto hot pasta noodles or place into an air tight container for up to 1 week and place in fridge until ready to use. Sauce will thicken upon being in refrigerator. **Nutritional facts are just estimates. Please utilize your own brand nutritional values to double check against our estimates. Does not include pasta.